Dogs have been humans’ best friends for a long time. Many people dress up their dog to make them look unique and create a personality for them. One of the popular items for dogs is a dog collar. The pet owner must have their dog a dog collar to ensure that it has an owner and is not a stray dog. However, people take the dog collar onto another level that it should not be just a normal dog collar. Different designs of the dog collar also makes the dog unique and stand out from the other dogs. Today, we would like to introduce to you the Top Ten list for of the best LED Dog Collars that are popular in 2019 that you will be tempted to get one or two after reading this article. First up for the LED dog collar is the product of Derlights. This 6-LED dog collar comes with 3 light setting modes. You just press its side button once for high bright light, twice for medium bright light and trice for emergency flash red light. This LED dog collar is light and portable with weight of only 0.045 oz. It uses USB port for charging that lasts up to 8 hours and is made with waterproof silicon material and stainless steel clip. This LED dog collar can also be used for other purposes such as the light for keychain, camping gear or light for your bike. Get this Derlights LED dog collar for you and your dog now to enjoy its multifunction. This Talis LED dog collar is popular for its special feature. It comes with 4 color choice for your dog such as pink, blue, red and green. It also has 4 light adjustment settings including steady on, slow flashing, fast flashing and off light. Its special feature is that it uses the solar energy to charge itself. Its solar panel will absorb sunlight while your dog is playing in the daytime and you can light up your dog collar at nighttime. It also has the USB charger for extra charging option in case of emergency as well. It is made with water-resist silicon and breathable nylon to comfort your dog. Reward your smart dog with this LED dog collar from Talis. Up next is a unique LED dog collar from Noxgear that catch the eyes of many dog’s owners. This dog collar is designed not only for wearing around dog’s neck but also around its chest and back. The 360° illumination makes it visible from far away nearly up to a mile. It has the 8 color selections and another 6 lighting settings such as rainbow or cool comet. Its rechargeable battery can quickly charge to perform up to 12 hours. It also comes with 4 different sizes for different types or sizes of the dog. It is waterproof and machine washable. Glow up your dog with one of these Noxgear rechargeable LED god collar bands. If you are looking for a simple LED dog collar, then this product from Onepet is the perfect fit for you. 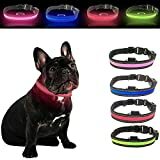 This LED dog collar comes with three colors which are the red strap with green light, black strap with pink light and green strap with red light. The built-in battery is rechargeable with USB charging. It is made with top-grade materials like leather, nylon and optical fiber to ensure the strength and comfy for your dog. It is lightweight and comes with many lengths for different dog breeds. You can refund for money back if this dog collar does not satisfy you or your dog. Make sure to get your dog with this Onepet LED dog collar. Here comes another piece of LED dog collar by HOLDALL. It comes with 4 colors choice for your preference including pink, blue, green and red. Inside each collar, there are 6 to 13 pieces (based on different lengths of collars) of LED light that ensures the fully bright light around your dog neck, unlike other brand that only has 1 piece of LED light in the collar. These LED lights are protected with silicon tube for durability. The rechargeable battery needs to charge only for 2 to 3 hours, yet can perform up to 10 hours. We guarantee that this HOLDALL LED dog collar will not let you down. Coming up next is the LED dog collar from Shine for Dogs. This rechargeable LED dog collar has the USB charger included in the package. 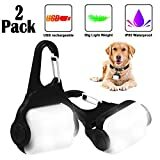 Its ultra-bright light makes this dog collar a unique product among other brand. With this ultra-bright LED light, you do not have to worry about your dog playing at night or in dark places. The fiber optics not only protect the inner LED light from water or hazard condition but also make your dog comfortable and durable for long term use. Get this LED dog collar from Shine for Dogs for your dog as well as contribute to help other rescued dogs. Do you prefer an affordable LED dog collar for your dog? 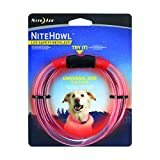 This dog collar by Nite Ize is the simple and affordable product to help protecting your dog in the dark area. 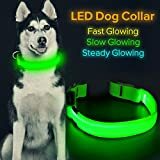 The LED light of this dog collar will illuminate color light through the silicon tube making the 360° light around your dog neck. The tube can be cut to specific length to adjust the size of your dog. The LED light uses the alkaline battery that can be rechargeable. It also has 3 light modes which are the light on, flashing and light off settings. This is one of the best flashing LED dog collars from Nite Ize you can get for your dog. Another piece from this list is the product of Blazin’ Bison. 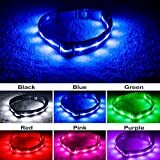 This LED dog collar comes with various color choices including red, blue, purple and so on. The special feature about this collar is that it can be visible from far distance up to 350 yards. Once fully charged, it can illuminate the bright light up to 8 hours. It has three light mode settings like light on, strobe and blink. It also comes with a lifetime guarantee so that you do not have to worry about the damage or malfunction of this dog collar. Protect your dog with this Blazin’ Bison LED dog collar. The BSEEN LED dog collar is another affordable product that you might be interested. The silicon tube can be cut to adjust to the size of your dog. It will not have any effect to the light either by the cut or your dog’s bite. It can be recharged by the mini USB cable included in the package. The touch switch is used to change to preferable light mode among the quick blink, slow blink and steady glow. It has got many positive reviews from customers. Grab the BSEEN LED dog light now to protect your dog. The top product of the LED dog light is the Illumiseen dog collar. With its exceptional features, this dog light has caught many customers’ attention. It is made with high quality of materials which makes your dog comfortable. It comes with three light modes like quick blink, slow blink and steady mode. Its rechargeable battery can light up to 5 hours. The special feature of this collar is that it has the LED dog leash that can perform the same function as its collar. 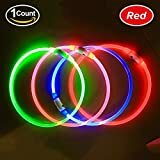 Get the combo of this LED dog collar along with its LED dog leash for your dog and it will be a perfect fit. To sum up, the above mentioned LED dog collars have their own unique features and price ranges. 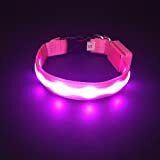 As a pet owner, you should decide to get one of these LED dog collar to not only protect your dog in the dark place but also lift up the fashion style of your pet. Your dog will be happy about their new collar as it is a LED type that has bright color light. 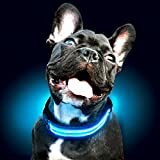 To help you choose the right LED collar for your dog, we have listed down the points that you should take a look and review any dog collar that you comes across. Let’s check them down below. Ready to use: For a dog collar, it should not have any complicated set up. It should be just easy set up and ready to use. That can save a lot of time when you put it on your dog. Size and Length: It is common that the dog collar will come with many different size and length. It is up to the owner to choose the one that has the right size length for their dog. Charging Option: You should look for the charging option of those LED dog collar whether it use the solar light, battery or recharge with USB cable. The more the charging options the LED dog collar has, the better it will be in the case of emergency. Quality: This is the most important part because you want get a dog collar that can be used for a long period. You must look for what materials the dog collar made of. It is the nylon, fabric optics, silicon or other materials. Different materials will have different durability and level of comfort for your dog.